Eddie Colla pays tribute to the Occupy Wall Street movement with a patriotic rendering of the iconic Guy Fawkes mask. Eddie Colla’s rendering of the Guy Fawkes mask is becoming one of the defining images of the Occupy Wall Street movement. Like Shepard Fairey’s “HOPE” poster, the image is clean, simple, and effective – an American flag stenciled over a Guy Fawkes mask, the same one worn by the hacktivist group Anonymous – and thanks to the photo-sharing site Flickr, it’s spreading quickly. 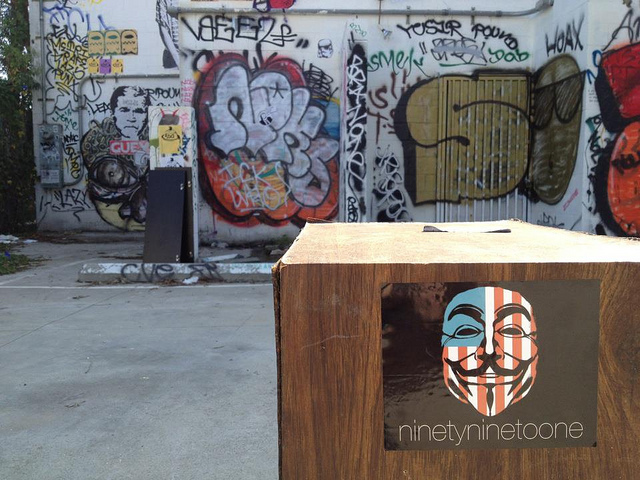 Sometimes the text on the graphic reads “NINETY NINE TO ONE,” an homage to the the OWS motto “We Are the Ninety-Nine Percent.” Other times the graphic says “Occupy Chicago” or whatever city you happen to be in. Colla doesn’t consider himself a street or graffiti artist, but there’s no denying his work’s prominence in public spaces. Since early October, Colla has mailed more than 6000 stickers to 40 states and 12 different countries, per requests on Flickr. Colla also offers the image for download on his Flickr account, and people have taken to sending him pictures of the graphic, once they’ve received them or placed them on the street. There’s no way for Colla to keep track of how many people have downloaded his images on Flickr, but the downloadable set has received more than 1,000 views. The Occupy Tampa graphic alone has been been viewed 300 times. However, Colla insist that, like much of the original punk rock movement, it’s done for the culture-jamming effect. And thanks to Flickr, it’s sticking.